As far as materials go I consider myself lucky. We have 2 onsite printing operations. Any material that I prepare I can get duplicated. Small quantities are done at a photocopy booth. No more than 40 copies, but they will take multiple pages and print them back to back or copy pages from books etcetera. Bulk printing is done in another section, minimum 50 copies. (Yes a disparity there, where do you go for 45 copies? Cheaper to print extras so go to the place that prints 50 or more). Costs are tightly controlled and all printing needs authorisation from the Thai administration. I routinely take in mini booklets of several pages and make 120+ copies. I do have to collate them and staple them by hand however. My printing needs are fairly light as I use PowerPoint a lot, so I never get questioned. I have seen the equivalent of multiple trees go through that place however. I have to provide my own laptop and stationery. I could use the School PC's but the convenience of a personal laptop makes it almost mandatory. My fellow English teachers are a mixed bunch. 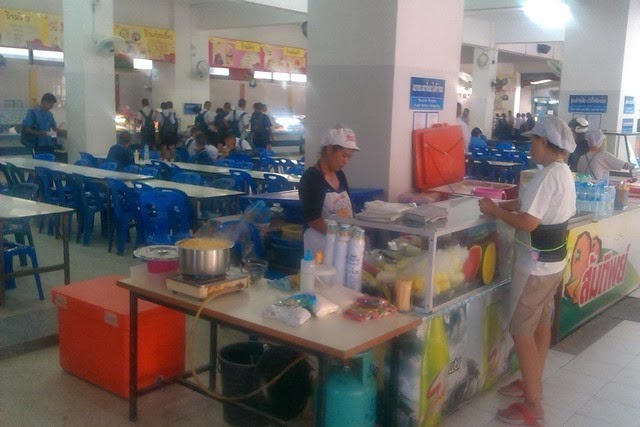 Some have Thai wives and teaching is a convenient way to earn money and stay in the country. Some are single and there for a multitude of reasons. Some are obviously escaping a past. All are unique in some way. This school does attract long term stayers however. I have an assigned desk and a very hard wooden chair. It is made from a lovely bit of wood well made, varnished, heavy and it would be worth some money elsewhere. I am cramped in amongst 5 other teachers and we all have to squeeze in to allow others to pass behind us. My desk has draws and I have no storage space. All of that has been nabbed by the existing teachers, as the newbie I have started at the bottom of the pecking order. We have 2 shared PC's, for 10 teachers and 2 Thai leaders and a printer. We are under orders to minimise printing on the local printer. Of course we need to print originals for duplication and lesson plans. Multiple copies of a document are frowned upon. We recycle paper and where possible we have to print on the back of previously used paper. I was issued with a Whiteboard marker. All the rest of my stationary I have bought or scrounged. We have a Thai Leadership and 3 Thai Administration assistants. They are all nice and friendly with varying levels of English skills. I have no idea why we need three assistants, they spend a lot of the day eating, chatting and watching things on YouTube. The Thai leaders are also Teachers and do lessons like we do, except they are in Thai. I have no official contact with any other Thai teachers or staff, but I am slowly forming relationships with a few. Mainly those who speak a little English or that I have bumped into for some reason or another. The Students. Isn't that what this is all about? Our School is a former all girls school and the number of girls far outweigh the boys. There are over 3500 students. Assembly is a sight to behold as they fill the assembly area and spill out to the sides. Once the ice has been broken the kids are lovely. They are polite and generally respectful. They like sharing a joke or having a bit of fun. Many come up to me and say hello and then are lost for words as despite all their training they have exhausted their conversational ability. Some are cheeky and cross boundaries that they would not dare to do with a Thai teacher. One girl recently walked out of an art class and proudly showed me her drawing. I don't believe that she was one of my students, she was just happy to show her work to someone. In a week I see something like 400 students, some for only 1 hour. There is no way that I can learn all of their names. As I walk around the school grounds I have to stop and wave or say hello or practice a bit of English. It is good. But it does mean that I have to be early for lessons as I can be held up along the way. In the classroom it is almost impossible to keep the kids quiet. The Thai teachers rule with an iron fist and liberal use of the cane. We foreign teachers do not use the cane and must use force of personality to maintain control. It is somewhat easier for a bloke as we tend to tower over the students. But overall we try to engage the students not dominate them. In a class of 45 students who are crammed into seating so that you cannot even get to some of them it is difficult to do much. Often it is more about keeping them amused for 50 minutes. Some rooms are so big that I doubt people at the back can hear you speak/shout. The smaller classes I prefer to get into a semicircle. Or several small groups. I have found that walking around the room is useful. If you are behind their backs they tend to stop the chatting and obvious things like texting on their phones. But if you do 1 on 1 with a student you can assume that the rest of the class are chatting not working. I try to talk with at least some students before the class is formally started while waiting for the latecomers to arrive. I really enjoy spending time with the kids - sorry I mean students. I have never had my own children, it is wonderful interacting with people who are on the edge of adulthood and want to engage with you. There are some real characters. A tiny boy in one of my classes is nicknamed Big. This is an obvious joke by his parents. He walks around with broomsticks for legs and trousers that would fall down without a tightly done up belt. And he grins such a disarming smile that I just want to laugh all the time. Academically I set my own Curricula. No one has ever given me direction, checked on my progress or shown more than a passing interest in what I am doing. While I am an independent person I would actually like some guidance and oversight. I have to submit 3 levels of written documentation. These are a Semester Plan, a Unit Plan and a Lesson Plan, for each class. Three levels of bureaucracy of which one is redundant. The Semester Plan is a good thing, it sets general directions. It is very generic. One of my Computing classes merely says that the students will learn Photoshop. This second semester is nominally about 20 weeks long. It needs to be broken up into Units. The reality is that I will be lucky to have 14 teaching periods with each class during that time. I thought 2 units, which would be the weeks before Christmas and then the weeks after, would be sufficient. It was pointed out to me that some people have 7 or more units per Semester. A unit that lasts 2 or at most 3 weeks! Get real. Then we have Lesson Plans. We are supposed to submit these two weeks in advance. What I find in practice is that the Plans get changed dynamically on the spot in the Lesson. I go back and find that half the lesson was not completed or that I have had to divert on a tangent. As a recent example I had to stop a lesson and explain the word "else" (as in 'what else did you do?'). I was floored at such a basic gap in knowledge. But I don't mind if a lesson is not completed as that means that I have material for next week or I have struck an area of misunderstanding and I can spend the next lesson trying to repair the lack of knowledge. Whatever happens I need to re-write the Lesson plan to match reality. I do this assiduously because next year I will have a ready made set of Lesson plans tried and tested. All I need to submit for these plans are a single printed page of information that gets stored in a folder. The actual plan is about two sentences. This is done to satisfy audit requirements, nothing to do with supervision or tracking what you teach. My actual lesson plans have the required information on page 1, which I print and hand up, and then a detailed set of notes on subsequent pages, including any tutorials, materials or assessments that need printing. These are my lifeline for getting through a lesson. I often also have a run sheet to keep me on track during lessons. I find that I have to improvise a lot. I had a double lesson today for example. I found that I had run out of work half way through. Partly because I had under prepared, but also partly because I had to skip material that was obviously too difficult. I had a reading printed and the students were struggling so I stopped and asked them to circle all the words that they did not know. I had a lot of circles and had obviously pitched the difficulty of the lesson too high.Too much to try and teach all of the words on the fly and I will probably abandon the exercise for this class. Always have a video on hand for times like that. I found a copy of "A Bugs Life" on the PC, the kids were happy to watch that till the end of the lesson. There is a constant battle to remember that the students have to do most of the talking, not the teacher. But then the other constant battle is to get the students to talk. Generally 2 or 3 leaders do all of the work. School day ends at 4pm. We are required to be onsite until that time even if we have no lessons. We need permission to leave the school in working hours, even if you are just going across the road to the 7/11 in our lunch time. Having said that there is no formal lunch break. Lessons start at 8:30am and continue until 4pm. Both the students and the Teachers eat when they get a break in their lessons. This is a good thing as the students eat over a staggered time period spread between about 10am till 1pm. There is very little food left after midday however. (See below). Due to my teaching schedule I tend to eat about 11:30 ish. I consider 12 noon or 1pm a normal lunch time, but I have had to adapt to local necessities. Some days I can take time, others I have to squeeze a quick break in between lessons. At our school there seems to be a rush between 11:00 am and 11:30. Best to avoid that time. Teachers buy their food at the same place as the Students and there is no preferential treatment, a teacher cannot walk to the head of the line as happens in some schools. 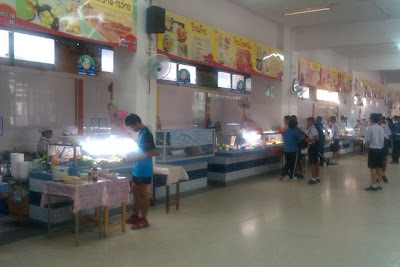 Typical Thai lunch time fare. 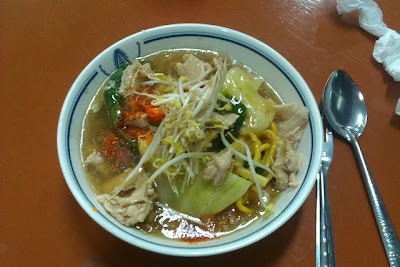 Noodles with Chicken, 20 baht! As far as food and eating goes we have a huge onsite eating hall and a smaller one for first years (M1) who eat together in a group. There are a number of food stalls selling all manner of Thai standard fare. The type of food that you will get in any Thai food market or see being sold by street side vendors. There are over 14 stands. Food is cheap and consists of all the Thai staples. Noodles in various formats, rice with curries and various options, fruit, deep fried stuff, the lovely Thai sausages on sticks, even a Sushi Bar. 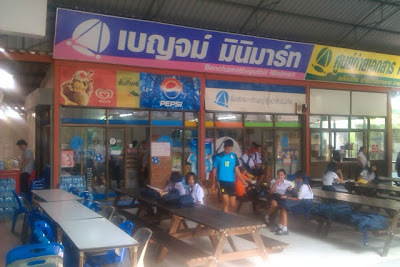 Plus a bakery run by the home economics students and a shop that would rival a 7/11 except that it does not sell beer and is mainly packets of chips and soft drinks. An unhealthy dose of fat and salt and sugar. Food hall - without students. I had to wait to get it this empty. I am slowly learning to be able to talk food, rather than just point at what I want, and had a small victory recently when I could ask for yellow egg noodles not the standard white noodles. Plus there is a local business that will deliver sandwiches and subs at a very reasonable price. At the end of the day I walk home. I routinely stay until 5pm. Partly because I have a reliable internet connection at School and partly because I am running hard to keep up with marking, and planning. After 4 weeks it is starting to become easier. My evenings tend to be quiet. I do not have a TV and it would be useless anyway as without a Satellite dish I could not receive English language channels. At the moment I tend to have a meal and then get back into lesson planning. The meal is either bought from nearby or now that I have made a kitchen area cooked at home. The reality is however that going out and buying Thai food is far cheaper than making it myself. So home made is becoming stuff that I cannot buy locally such as pasta. If not doing school work I tend to read. I have already run out of reading material but there is a lively community amongst the teachers of swapping e-books and I am now getting new reading material. However I dislike reading on a computer screen, I prefer curling up on the couch with a proper book. On Monday night there is a market literally outside the school gates covering an entire block. I go there to find my evening meals. If I wanted to I could buy pretty much anything that I wanted in the way of clothes, music, shoes, household items. But I want so little. After School on Friday I take all my school clothes to a local Laundry. They wash, dry, press and fold my 5 shirts and one pair of trousers for 90 Baht. My only concern with this place is that my shirts feel slightly damp when I get them back. I need to hang them up to complete drying pretty quickly. The rest of my laundry I take on Saturday morning to a different laundry and wash them myself in a pay for use washing machine. I normally take all my bedding, towels, casual wear and underwear and do two machine loads for 60 Baht. I have set up a washing line, made from string at home where they can dry. I bought a Motorcycle shortly after getting here. Public transport is not very good. It is not always easy to get a Tuk Tuk or Motorcycle Taxi when you need one so it quickly became obvious that I needed transport. The Motorcycle is 125cc and is great for around town but far too slow for highways. I had a frightening experience on the highway when I took a wrong turn and was in the midst of cars and trucks doing well over 100km/h. I pushed my bike up to 90km/h and was in constant fear of being side swiped by passing trucks. That pretty much covers a usual school day. Plus some extras.